← It is your lucky day. Wow it’s been forever since I’ve done one of these it seems. I’ve got the living room painted but not trimmed- no picture there. I’d take one right now but it looks as if world war III just concluded in there. 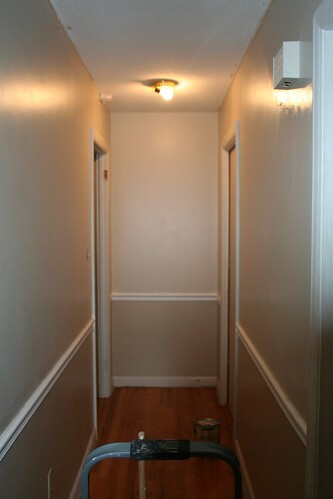 I did get the hallway done, don’t know if I posted that picture already but here it is again, in case I didn’t. I love that picture because my floors look amazing in it! Trust me, in real life- they look nothing like that. At all. We’ve got good things happening round these parts! They are (hopefully obviously) not done but the carpenters are coming back on Friday to put up the molding and then there is going to be a desk in between them. 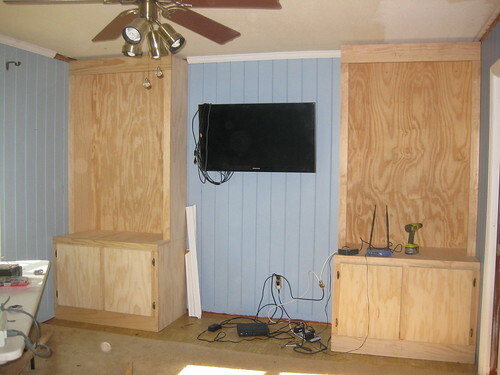 Not only that but we are also putting in two benches in the breakfast room (with storage- woot!) which will also be done on Friday. Now I just need to find a new kitchen table and I’ll be set. And just because of that statement- I’m now looking for a futon. This entry was posted in Uncategorized and tagged A nice futon with a tie dye cover will fit beautifully, bookshelves and breakfast nooks, I will not succumb to your decorating pressure!, This Ugly House. Bookmark the permalink. It’s going to be beauuuuuuuutiful! And screw grown up furniture.